Moscow. January 8. INTERFAX-AVN - Work on the modernization of the next batch of fighter-interceptors in the guise of the MiG-31BM has already begun, a source in the aircraft industry told Interfax. "A new contract has been signed with the Ministry of Defense of the Russian Federation for the overhaul and deep modernization of another fighter-interceptor batch in the MiG-31BM standard" said the agency’s source. According to him, the MiG corporation (included in the KLA) has already started work on modernization and will continue the implementation of this state order in 2019. 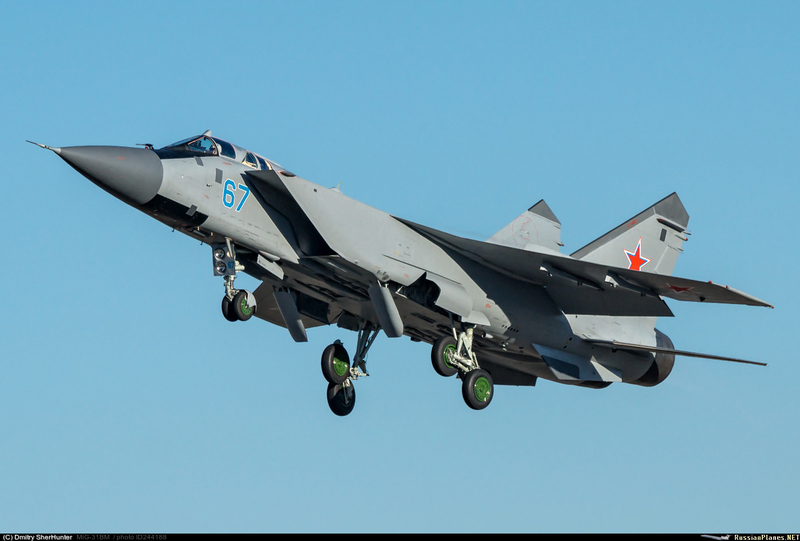 On August 24, UAC President Yury Slusar told Interfax that the entire fleet of interceptor MiG-31s ​​will be upgraded by 2023. “We expect that in the coming years, the VKS will receive a few dozen more modernized MiG-31BMs, so that by 2023 the entire existing fleet will be modernized,” Y. Slyusar said. According to some information, at present there are about 120 MiG-31s ​​in the Russian Aerospace Forces, plus about 150 more planes at storage bases. It is estimated that there are around 100 modernized MiG-31BMs in service today. The MiG-31BM supersonic fighter is designed for long-term patrols and combat high-altitude reconnaissance aircraft, strategic bombers and low-flying targets. The aircraft is able to simultaneously hit 6 and accompany up to 10 air targets. No , noway, the number of stored MiG-31 is much less than 150 and not all are in conditions for modernization. Pilots of the Kamchatka Fighter Aviation Squadron are ready for new challenges. And they, undoubtedly, will take place, because, first, we returned to the Arctic seriously and for a long time. Secondly, in the near future, a squadron under the command of Lieutenant Colonel Koderle will receive deeply modernized MiG-31 BCM aircraft, which possess higher technical capabilities and combat potential. And that means: Kamchatka "falcons" are waiting for new tests in the Arctic, which are difficult and therefore especially interesting. However, the next modernization of "several dozens" will be MiG-31K from the remaining MiG-31DZ (about 50). Tsavo Lion wrote: For large UAVs like the RQ-4/-170 & the MiG-31 is a good platform to engage. [i]As of January 2018, the U.S. Air Force budget for 2018 had indefinitely postponed the retirement of the U-2. that's why MiG-41 is built for. BTW would it be a ram/scram jet with water injected to inlet to cool down incoming air + prevent engine form thermal choking? The MAI proposed a scheme for a hypersonic water engine. It is assumed that the accelerator with water on board will lift a space rocket to an altitude of about 40 km and accelerate to seven speeds of sound. MOSCOW, January 19. / TASS /. In the branch "Vzlet" (city Akhtubinsk, Astrakhan region) of the Moscow Aviation Institute (MAI) have developed a scheme of a hypersonic water engine. The concept is given in the theses of the report of the company's employees, which will be presented at the Academic Cosmonautics Readings (to be held January 29 - February 1). Abstracts are published on the website of the Moscow State Technical University (MSTU) them. N. E. Bauman where the event will take place. The report describes such a phenomenon for air-jet engines as hyperforcing, obtained at supersonic and hypersonic flight speeds due to the supply of water to the engine entrance. Moreover, water not only improves the performance of the motor, but also protects against overheating, the publication notes. We dont talk about the same, Im afraid. You re talking bout MiG-31 Im talking bout MiG-31BM. The original MiG-31 could fly at mach 2.4 for as long as it liked, but mach 2.6 for 20 minutes only and mach 2.83 for 5 minutes only due to excess heating. If the improvements allow mach 3.2 flight speed is that thrust limited or heat limited? Water injection is also used on very large bombers to increase thrust on take off... it creates thick black smoke however. In 2019, after thirty years, the Ministry of Defense will resume patrolling the airspace in the North Pole area. 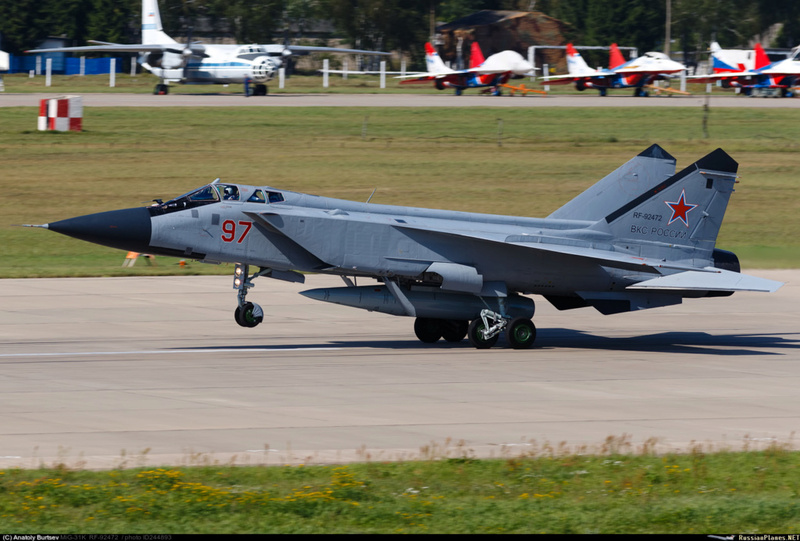 Some of the fastest airplanes in the world, MiG-31BM interceptor fighters, will take up combat duty. They received the nickname “Fox Hound” for their unique flight characteristics. MiG-31BM develops speed up to 3 thousand km / h and is able to catch up with any existing military aircraft. Squadrons of the Northern and Pacific fleets will operate in the Arctic skies, which will allow controlling the entire Arctic region. According to experts, the air corridor over the Arctic is especially important, as a potential enemy from this direction can strike at areas of the Urals, Siberia and Central Russia. As they told Izvestia in the Ministry of Defense, until the end of 2019, two squadrons of MiG-31BM Northern and Pacific fleets will take up combat duty. In 2018, a series of tactical flight exercises were conducted to patrol the Arctic zone. The experience of using these aircraft in the Arctic region was considered successful. During the exercises, the crews were in the air for five hours or more, the flight was also made over a distance of more than 4 thousand km. During the flight, refueling was carried out in the air, without which patrolling of this desert region is impossible. Zvezda is a journal where write journalist. I've never heard any information about top speed of MiG-31BM from Duma, if you have could you please share one? TV Zvezda ( not voyennna priyomka - sorry ): made a coverage from assembly plant where MiG-31s are upgraded to BM standard. 1:55 Vladimir Kirasov, dept tech manger of Sokol: Currently (i.e. after modernization) there are no speed restrictions and aircraft can fly according to design specs. Of course you can believe in other sources then MoD but I prefer to stick to Russian MoD ones. For instance all those claims of enormous airframe hours for western aircraft are usually based on serious limits for use... ie no high g operations and no high speed operations and no operating from short rough air strips etc etc. For the MiG-25 and the MiG-31 that replaced it, high speed flight was an important aspect of its operational role, so speed restrictions were not about airframe life, they tended to be more about temperature limits of the engine and the various airframe components including the canopy. The flight speed limits for the MiG-25 are engine related, and while the limits for the MiG-31 always were claimed to be engine related it is certainly possible that they were canopy related too. February 13. Interfax-Russia.ru - The air fleet of the Northern Fleet received two upgraded MiG-31 interceptor fighters, the press service of the Northern Fleet reported. "Two MiG-31 fighters replenished the squadron of a separate mixed air regiment of the Air Force and Air Defense of the Northern Fleet after modernization," said the press officer. "In total, in the winter period of training for 2018-2019, the regiment received eight such vehicles that are already involved in the planned combat training of the flight personnel," the press service of the Northern Fleet said. Its nothing about version there but since RuN aviation shall complete 2 interceptor squadrons till end of 2019 thus most likely MiG-31BM. Today, two high-altitude fighter-interceptor MiG-31BM, which are part of a mixed aviation regiment, returned to the airfield of naval aviation of the Pacific Fleet Yelizovo after repair and modernization. 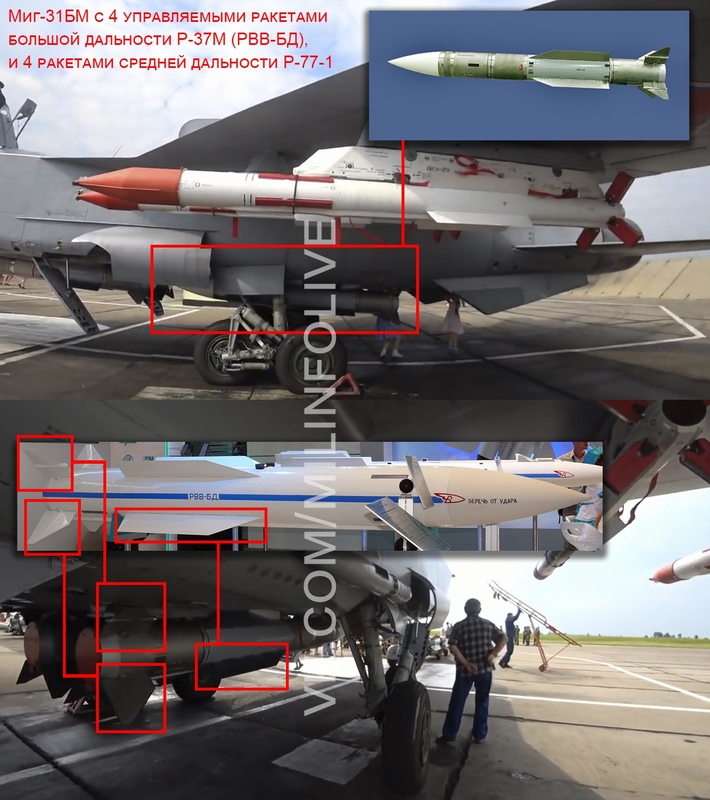 In the course of factory repair with modernization, the avionics and radio electronic systems of the aircraft were updated, the tactical characteristics of the interceptors were improved, which increased their combat capabilities. Returning to the duty station, a pair of fighter-interceptors made a long flight over a distance of more than 7 thousand kilometers. The renewed aircraft in Kamchatka was met by Commander-in-Chief and forces in northeast Russia, Rear Admiral Alexander Yuldashev. He congratulated the crews on a safe return home and wished the pilots success in the service. It is planned that by the end of this year, the naval aviation of the Pacific Fleet will be strengthened by several more modernized MiG-31BM fighters. The squadron of Monchegorsk had 10 BM and need other 2 BM for complete. MiG-31BM with R-37M in the regular unit. So, R-37M are now operational. I hope we will soon see them on Su-35 and later on Su-57 as well. It's interesting that they kept metal body like on r-33 and no stealthier composite. Awacs will detect it from far away. And then? What would the AWACS do? The R-37M travels with a speed of M6. The aircraft will be toast before the radar goon can end his report. Hole wrote: And then? What would the AWACS do? The R-37M travels with a speed of M6. The aircraft will be toast before the radar goon can end his report. Now it should be called "Arctic Fox"! The F-117 was made of metal was it not stealthy?